2. Focusing on the role actually played by the monitoring of democracy and the Rule of Law in ten candidate countries, scrutinizing the way the EU used the legal tools and competences outlined in its enlargement law. 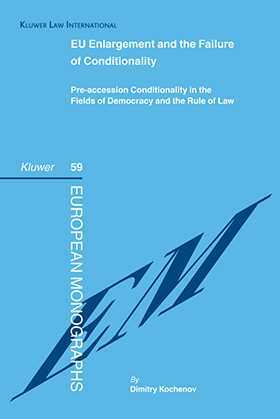 The book adopts the EU’s own understanding of democracy and the Rule of Law, as derived directly from the substance of the numerous legal and political instruments issued by the Community Institutions and especially the Commission in the course of the pre-accession process. In this way it demonstrates the actual – as opposed to the officially announced – role played by the assessment of democracy and the Rule of Law in the candidate countries in the regulation of enlargement. Many formidable inconsistencies in the application of the conditionality principle are thus laid bare. This leads the author to a series of recommendations on policy and procedure that he demonstrates could be profitably applied to the regulation of current and future accessions, using the Commission’s own structure of monitoring pre-accession reforms in the three areas of the legislature, executive, and judiciary in candidate countries. The probity and soundness of these recommendations, firmly grounded as they are in the actual pre-accession monitoring and its consequences for the pre-accession progress of ten Eastern European countries admitted to the EU in 2004 and 2007, will greatly interest policymakers and scholars concerned with the future of European integration.